First Presbyterian Church is dedicated to guiding students to a more committed relationship with Christ as they develop socially, physically, and spiritually. Athletics provide a unique environment for demonstrating and teaching the virtues of self-control, patience, love, service, respect for authority, ethics, leadership, hard work, and dedication, as they relate to the teachings of Jesus Christ and Biblical principles. Games Game schedules will be posted with the most up to date changes via the button above. 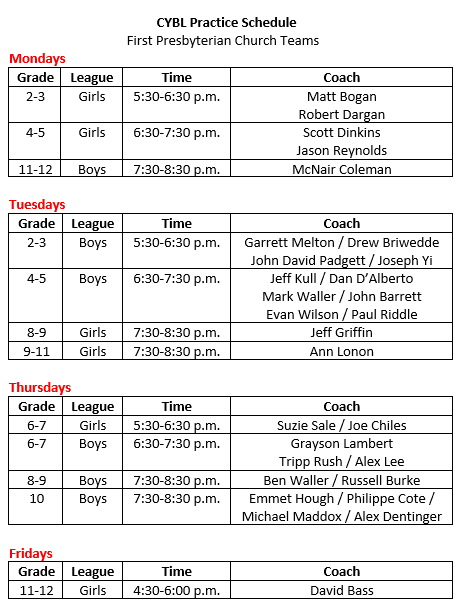 Practices Practice times and coaches for FPC teams are listed via the button above. Practices need to be scheduled with our office and security team. The handbook of rules and Bible Lessons are available for coaches and devotion leaders via the button above. Background Checks All CYBL Devotion Leaders, Referees, and FPC coaches are required to complete this background check form every 3 years. You may print this form and email it or drop it off at our office in The Bridge.